Panhandling has gone high tech in Detroit, with one man taking handouts on a smart phone with a credit card reader. 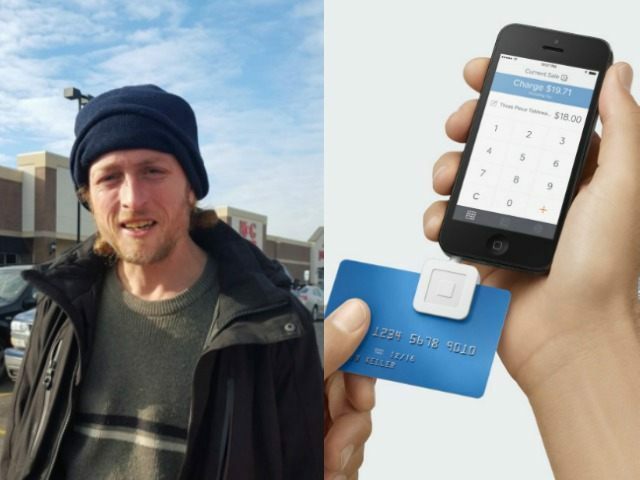 CBS Detroit found a homeless man named Abe Hagenston who uses a cell phone to swipe credit cards when people respond to his calls for alms. Hagenston, who calls himself “Honest Abe,” was panhandling near the 8 Mile overpass on I-75 when the TV news folks caught up with him. Abe proudly noted that he has helped organize some of the panhandlers in his area into a union of sorts. He says they’ve worked out a schedule to panhandle in shifts to avoid stepping on each other’s territory. Disappointed that Detroit hasn’t seen much snow to shovel for extra cash, “Honest Abe” said his intake hasn’t been as good as it could be. But the new credit card swiper is helping. The credit card reader Abe is talking about is a small device by a company called Square that can be plugged into a cell phone which turns the phone into a credit card scanner. Many small businesses and some bars and restaurants have turned to using the Square readers instead of purchasing the larger, counter-mounted machines we are all familiar with. According to The Roanoke Times, 63 percent of transactions processed with the Square system come from sellers with less than $125,000 in annual payments. Despite the growth in the use of its services, though, Square is still not a profitable company. In the last quarter of 2015, Square reported net losses of up to $54 million, bringing total losses to about $131.5 million for 2015. The company also reported a net loss of $154 million in 2014. As to Detroit, in 2015 the number of homeless actually decreased a little over the number seen in 2013. The city recently reported there were 2,748 homeless individuals in the Motor City last year, down 282 individuals as counted in 2013.